Over the years I have tried a lot of different recipes for pizza dough. The pizzas that I made were always successful, but I was never blown away by the crust. I’ve found you can disguise a mediocre crust with really great toppings, but why settle for mediocre? When I go to my favorite pizza restaurants I would never discard that extra inch of bread, yet at home I always did. I needed to do something about that. That’s where this recipe comes in. This recipe yields dough that is crisp on the bottom with a tender and chewy crust around the edges. You aren’t overwhelmed with a flour-y taste and it has just the right amount of olive oil flavor. It works just as well with plain cheese pizza as it does with a flavorful BBQ Chicken pizza (like the photo, recipe to come). Quite simply, it’s the perfect pizza dough. Do not be intimidated by the length of these directions, it’s really not difficult to make and the recipe makes enough for 2 pizzas, so the work of one day spreads to 2 meals! *Warning – I took a LOT of photos of this process! Stir together 1/2 cup of warm water with the sugar. Sprinkle the yeast over the water and allow to proof for 5 minutes (yeast will dissolve, water will start to look milky and foamy). Stir in the room temperature water and olive oil. While the yeast is proofing, stir together the bread flour and salt. 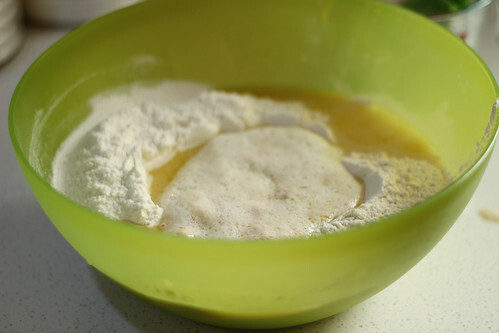 Create a well in the flour and pour in the water/yeast mixture. Using a strong wooden spoon, begin to work the flour into the liquid. 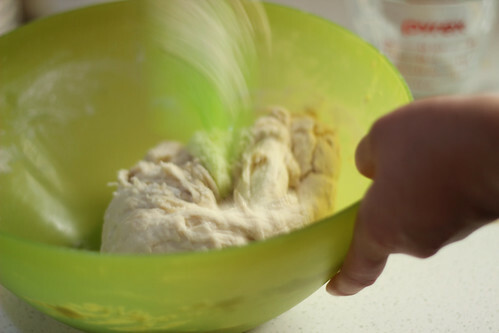 When it becomes too difficult to do by hand, flip out onto a lightly floured surface and knead with hands for 10 minutes until it forms a smooth and elastic ball, adding only enough flour to work surface and hands to keep dough from sticking. If the dough seems too dry and hard to knead, you can add additional water, 1 tablespoon at a time. Alternatively, use a standing mixer fitted with a dough hook to combine flour and salt. Pour in the liquid and allow to knead on low speed for 5-10 minutes until the dough is smooth and elastic. Spray a large mixing bowl with non-stick cooking spray or coat lightly with olive oil. Add the ball of dough, gently moving it around the bowl to coat with oil. 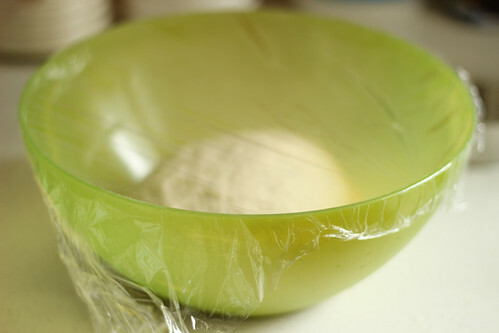 Cover tightly with plastic wrap and allow to rise for 90-120 minutes, or until doubled in size. Punch down the dough. If you plan to bake immediately, preheat oven to hottest temperature (450-500 degrees F) and place a pizza stone in the lower 1/3 of oven. If you plan to use later, divide dough into 2, shape into balls, cover tightly with plastic wrap, place in a ziploc bag, and freeze. Later, remove dough from freezer and allow to thaw in fridge overnight, then proceed to following steps. Do the same with one ball if you plan to make one pizza now and one pizza later. Divide dough into 2. Cover with a clean, damp towel, and allow to relax for 10-20 minutes. 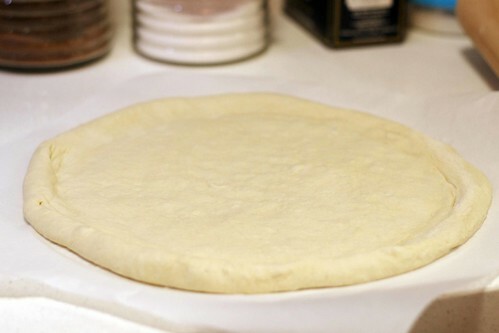 Working one at a time, place the dough ball on a lightly floured sheet of parchment paper. 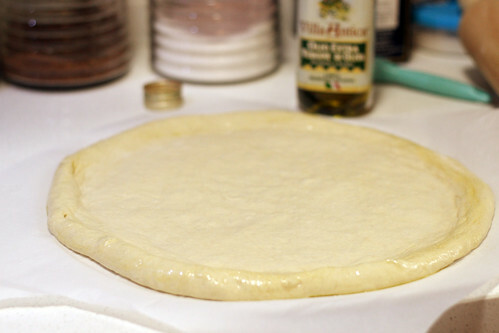 Use hands and begin to stretch the dough, turning the parchment paper as necessary to keep an even round shape, into a 12-inch round. Using a pastry brush, apply a thin layer of olive oil to the outer inch. 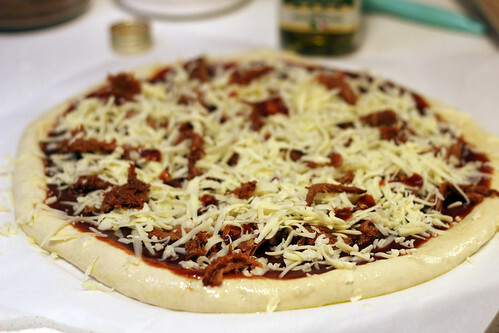 Top with desired toppings, leaving the outer 3/4-1 inch ridge. 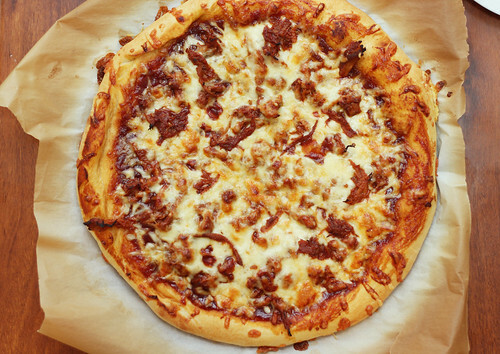 Using a pizza peel or large cookie sheet, transfer parchment paper and pizza to hot pizza stone and bake for 8-12 minutes or until the outer crust starts to turn golden brown and the cheese is melted and bubbly. Repeat with second ball of dough, if using right away. Always preheat oven to highest temperature at least 30 minutes prior to baking. Hot, hot, hot ovens are how pizza delivery joints get crispy crust. If you are having trouble stretching your pizza dough, allow it rest for 5-10 minutes. This gives the gluten time to relax. Don’t be afraid to cook the pizza right on the parchment paper. It makes it much easier to transfer to the oven. Well kids, I’m baaack! After an exhausting 36 hours of traveling, I arrived back in Suzhou early Sunday morning. I settled my luggage in and then we headed out to grocery store. I had pretty high hopes for myself that I would be able to make dinner Sunday night – instead I took a “short” nap at 2:00. At 7:00 I forced myself to at least move to the living room, where I promptly fell asleep again. I guess I needed it. The good news is that by Monday morning I was feeling much better – and ready to get back into the kitchen! Because I looooove the smell of fresh baked bread, because I’m a sucker for peanut butter and jelly sandwiches, and because it was Monday and just seemed like the right thing to do, I made a loaf of American style sandwich bread. 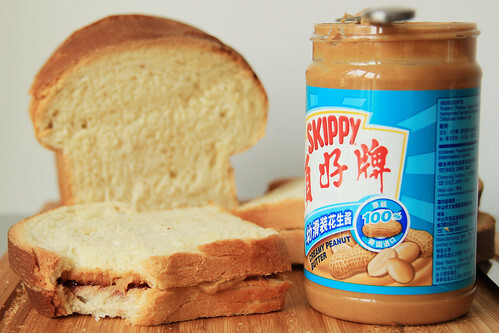 If you are looking for a good sandwich bread, this recipe is it. 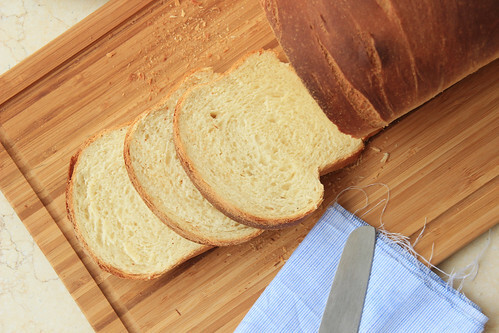 The crumb is dense and sturdy enough for any sandwich, but the taste is still light and fresh. I have a feeling this bread will be making a weekly appearance in my kitchen. *The “big move” meant leaving behind my beloved standing mixer, so for now I’m hand kneading and mixing. I will still include the directions for using a standing mixer, though. Let’s face it, it can be done by hand but it’s way easier with a mixer! Prepare an oven by heating to 200 degrees. Once it has reached 200 degrees allow to heat for another 10 minutes then, turn the oven off. This warm oven will the perfect environment for rising dough. In the bowl of a standing mixer, whisk together 3 1/2 cups of flour and 2 teaspoons salt. 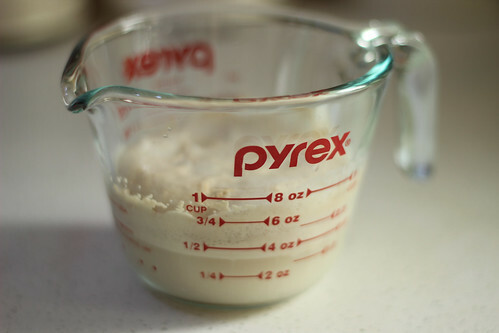 In a 2 cup measuring cup, mix together the warm milk, water, melted butter, honey, and yeast. When the yeast has dissolved and started to foam, fit the standing mixer with a dough hook. With the mixer on slow speed, pour the liquid into the flour. Once the dough comes together, increase the speed to medium and allow to knead for at least 5 minutes. Adding more flour a tablespoon at a time, if necessary. 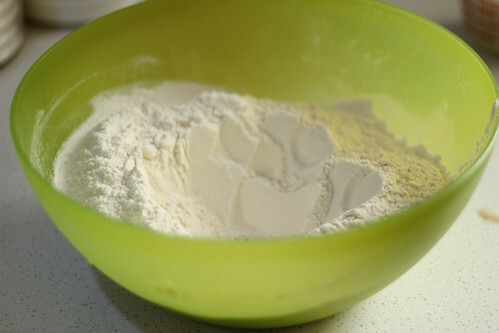 If mixing by hand, create a well in the center of the flour and pour the liquid in. Use a wooden spoon to stir together until it becomes too difficult, then use your hands. Dump the dough out onto a lightly floured surface and knead by hand for 10 minutes, or until dough is smooth and elastic. 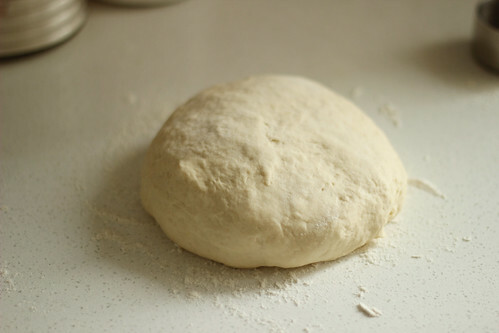 When the dough is smooth and elastic form it into a ball. Place the dough ball into a lightly oiled bowl. 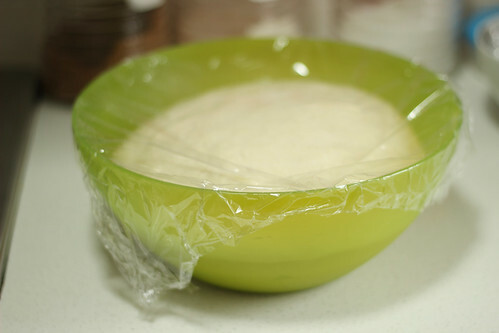 Cover the bowl with plastic wrap and place it in the warmed oven. Allow to rise for 40-50 minutes, or until doubled in size. Once the dough has doubled in size, punch it down and turn it out onto a lightly floured surface. 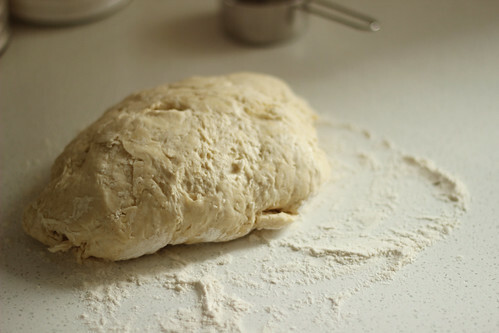 Knead for a few seconds then form into an 8-inch square. Starting with the edge furthest away from you, roll the dough into a cylinder. Turn the cylinder seam side up and pinch all along the seam. Place the dough into a lightly greased bread pan seam side down. Cover with plastic wrap and place in a warm, draft free, place, for 20-30 minutes. While the dough is rising preheat the oven to 350 degrees. Fill a baking dish with 2-cups of water and place on the bottom rack in the oven. Bake the bread until an instant read thermometer reads 195 degrees, about 40-50 minutes. 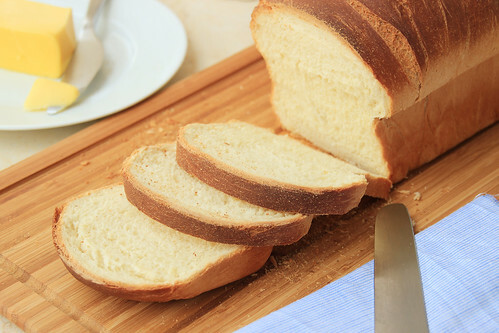 Remove the bread from the pan and place on a wire rack to cool.